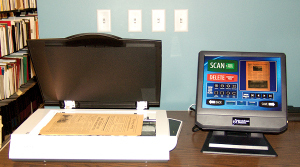 A book scanner is one of the APRL’s most frequently-used resources, and a second scanner will soon be available for patrons, staff, and volunteers to use. In an age when libraries are often considered dinosaurs – rendered obsolete by the rise of digital information – it might seem incongruous to build a new library. Yet, in many communities, libraries are busier than ever and library building and renovation projects are going full steam ahead. A study of public library engagement in America conducted by Pew Research found that technology users are also library users (Turns out most engaged library users are also biggest tech users, PBS NEWSHOUR). The full report is available from the Pew Research Internet Project. Meanwhile, the Boston Public Library, the “oldest public urban library in the country,” is undertaking a massive renovation project to make its main library more inviting (Breaking Out of the Library Mold, in Boston and Beyond, New York Times). The renovation will preserve access to traditional library resources while providing space for new technologies and activities. 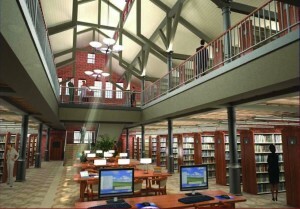 Architect’s rendering of the new library space. Philatelic libraries are increasingly using print and digital resources side by side to get the best information possible. Recently the Smithsonian Libraries digitized a John Tiffany manuscript, and have made it available for anyone to help with the transcription that will eventually make the 19th-century document fully searchable online. The Rocky Mountain Philatelic Library in Denver is producing a series of online videos. The Postal History Foundation has indexed its journal, The Heliograph, using the online Philatelic Union Catalog. The APRL has many digital projects in the works, including a growing collection of online exhibits, digital finding aids helping researchers discover and navigate unique archival collections, and an upcoming map digitization project. The new APRL space currently in progress will provide space for protecting and accessing our valuable print collections as well as space for digitization projects and for library users to scan a variety of formats and plug in their own devices. Nice to see the article – thanks to Roger Brody and others. Highlights the continued viability of libraries, and the continued role they can play in the modern electronic information age. No matter what – folks are still going to look for the original source, the hard copy, the reference piece, the manuscript etc. that lies buried in some dirty box that the staff of libraries can locate. The trick will continue to be getting those resource poor libraries to learn new tricks, find new ways, and adopt new practices to stay current with the every evolving, modern digital age. I don’t think many of us feel that we’ve found the key to those tricks, or for that matter feel that we can really aspire to staying ahead of that curve. In other words, it seems that we’re always behind in that 3 balls – 2 strike count!